The federal immigration minister took aim at the Ontario government on Thursday, saying Doug Ford's administration is stoking fears around asylum seekers and is not offering solutions to the issue of illegal border crossers. Federal Immigration Minister Ahmed Hussen took aim at the Ontario government on Thursday, saying Doug Ford's government is stoking fears around asylum seekers and is not offering solutions to the issue of illegal border crossers. "They are not engaged. Instead they have unfortunately decided to engage in fear mongering and demonizing of asylum seekers, which is not what Canada is all about," said Hussen in an interview with CBC News Network's Power & Politics. The minister was responding to a news release from the Ontario government that said the federal government does not have a "credible" plan to deal with asylum seekers crossing into Canada. The press release also quoted Ontario's minister responsible for immigration, Lisa MacLeod, as saying "In Toronto, approximately 40 per cent of shelter occupants are refugees." Hussen dismissed that number saying, "The figures that are being thrown around are not based on facts. They are based on speculation,"
He went on to criticise MacLeod directly saying she has called asylum seekers names. "She has labelled all of them as economic immigrants. She's said that none of them are genuine refugees," said Hussen. MacLeod responded to a clip from the interview on twitter calling Hussen a bully. "Fix your border issues and pay Ontario the $200 [million] you owe us," she tweeted. Kapelos: On the issue of refugees, I mean, we have Lisa MacLeod saying that 40 per cent of Toronto shelter occupants are refugees. They are saying there is a crisis there. We have numbers that show in 2017 25% of those occupants were refugees and in 2016 it was just 11%. Hussen: Lisa MacLeod is engaged in fear mongering and using this issue to demonize people. Kapelos: What evidence do you have for that? Hussen: I'll tell you, the Toronto shelter system does not ask questions on the status of those who are seeking shelter in their system. Kapelos: So her department is lying when they say that they are 40 per cent of the people? 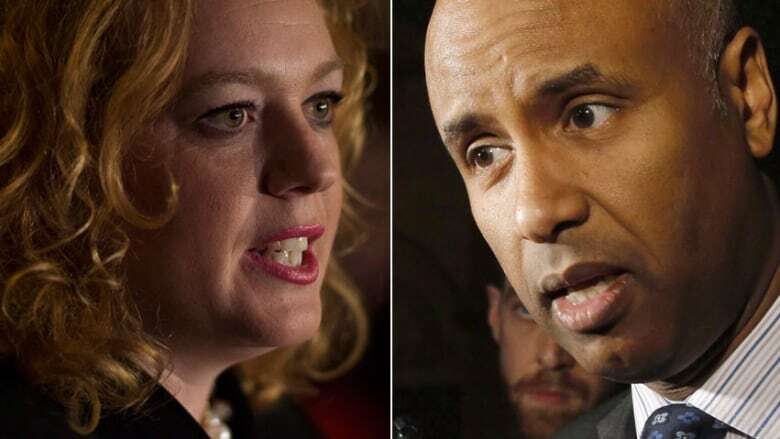 Hussen: How would Lisa MacLeod know who is accessing the system if the temporary housing shelter system in Toronto does not collect stats based on status? Number one. Kapelos: Wasn't [Toronto Mayor] John Tory also saying that though as well? Is he lying too? Hussen: No I'm saying that the figures that are being thrown around are not based on facts. They are based on speculation...the status of people seeking access to the shelter system in Toronto is unknown, therefore to put a number on that, is simply not factual. Hussen: I'm saying that it doesn't withstand scrutiny and the record of Lisa MacLeod speaks for itself. She has not engaged in our plan to engage with the city of Toronto to triage asylum seekers away from Toronto by regionalizing the issue so that we can have other cities step in to work together. Kapelos: Explain what you mean by that? Hussen: What I mean by that is Canadians expect all orders of government to work together when we have challenges. On the issue of asylum seekers, the federal government has stepped up. We have provided not only funding through the Canada social transfer; we've provided additional funding of $50 million dollars, $11 million of which will go to Toronto and Ontario to deal with this issue. Now we had a plan in place to work through Ontario and Toronto to conduct a triage system that will relieve pressure from the city of Toronto. The province of Ontario chose to walk away from that system. We're still at the table. We're working with the city of Toronto to triage people away and we have successfully done that to the city of Chatham, Ontario, and others, to relieve pressure from Toronto. So, we're there. We're providing not only funding, but we're actually bringing solutions to the table. The government of Ontario is not doing that. They are not engaged. Instead they have unfortunately decided to engage in fear mongering and demonizing of asylum seekers, which is not what Canada is all about. Kapelos: Do you feel that John Tory also demonized asylum seekers, because he raised the exact same concerns, to be fair? Hussen: No. I engaged John Tory on that and I told him we will always be there for the city of Toronto. The difference between John Tory and Lisa MacLeod is that minister MacLeod has called asylum seekers names. Kapelos: What has she called them? Hussen: She has labelled all of them as economic immigrants. She's said that none of them are genuine refugees. Which is something that we trust our immigration refugee board to do. And so, we have to respect the system that we have. We have mechanisms in place. Kapelos: You're saying that Lisa MacLeod said not a single asylum seeker is a genuine refugee. When did she say that? Hussen: She said on her twitter — that these are economic migrants, that they are not genuine refugees. So this is factual. It's on the record. But the fact of the matter is, the IRB [Immigration and Refugee Board] is in charge of determining who is a genuine refugee and who is not and we have to respect the independence of the immigration refugee board. Those who are determined to be refugees will stay in Canada. Those who are not will be asked to leave our country. That is part of our law. Kapelos: Critics are saying that your government's plan is not adequately working, that this is not a sustainable way to manage this issue. Kapelos: Actually the numbers are up. Hussen: I'm talking about the numbers compared to last year. Kapelos: You're talking month to month. If you're talking year-over-year there's actually more asylum seekers that have crossed into Canada this time this year compared to this time last year, overall. Hussen: What Canadians expect us to do is to work with all orders of government to make sure that when challenges present themselves, we come up with solutions that each level of government is able to implement. The federal government is there. We've worked very closely with the city of Toronto. We were willing to engage the province of Ontario, they decided not to be part of the solution. We haven't left the city of Toronto on its own. We've provided not only money but a triage system to triage people away from the city of Toronto while they wait for the hearings. We have to let the system take its course we've signed international agreements that are part of the Canadian Charter of Rights and Freedoms to allow asylum seekers at least to get a fair hearing, so that those who are deemed to be genuine refugees can be determined to be so, and those who are not can be determined by the same independent system. That is the system that we have and that is the system that we remain committed to.